Mechanisms in Cardiology is an animated, unique series of educational modules in cardiovascular medicine. It is a highly innovative, incorporating latest medical animations into educational resources, for cardiovascular specialists and family physicians. This module series links the latest medical evidence to practical clinical case studies. Developed by key opinion leaders in Canada and the United States, Mechanisms in Cardiology provides physicians managing cardiovascular disease with the latest concepts in cardiovascular medicine. This knowledge-based resource is made easy to understand by using state-of-the-art animations, accompanied by narrated audio sound-tracking, allowing this medium to epitomize the adage "a picture is worth a thousand words". Complete educational modules are available as "on-line overviews of current practice". Each module contains a comprehensive learning experience, intended for the self-directed learner, or for an accredited group-learning activity. You may review a brief chapter text or an interactive case study, peruse a PowerPoint slide lecture, download an algorithm, or update your knowledge on the latest mechanisms in a disease state or drug mechanism or action. This resource provides physicians with a unique, easy-access learning and teaching content in cardiovascular medicine. 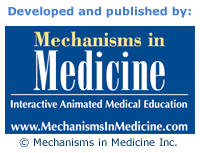 Mechanisms in Medicine has over 10 years of experience in the development of interactive, animated medical programs. Our mission is to utilize animations, multimedia and handheld technologies to improve current medical knowledge. We address the needs of practicing physicians and allied health care professionals and their patients by doing thorough analyses of learning needs. Our goal is to advance best-practice medicine and we are dedicated to the purpose of providing health professionals with continuing education programs of distinction and integrity to address the global needs of health care and medicine. For more information please visit our website: www.MechanismsinMedicine.com In addition, please visit our YouTube Channel, our Facebook page or follow us on Twitter by clicking on the icons below.